Property Developer Urban Construct has submitted a proposal to build a 379 unit apartment building on the corner of Chester and Ella Street in Newstead. Designed by ML Design, the development is mostly weighed towards one bedroom stock, with 299 one bedroom apartments and 80 two bedroom apartments included. The DA shows two separated towers rising 17 levels high. A 4 level podium is planned across both towers. The proposal aims to activate both Chester and Ella Streets through the incorporation of two separate commercial tenancies on ground level. A pedestrian friendly ‘Urban Common’ located towards the end of Ella Street is designed to incorporate opportunities for public artwork while also facilitating activation of the streetscape / pedestrian realm. 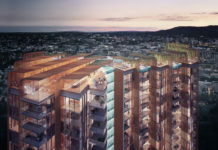 The project includes a lap pool, BBQ areas and other resident amenity on level 15. Pity it will never get built. Aren’t these guys broker than broke ? Totally needs a skywalk on level 15 between the two towers! That is one ugly building after the first 4 levels. Seriously diluting the quality of the area with such poor bland design. Bort is spot on. It looks like a former bomb shelter with a apartment block (bland) on top. Or an old heritage building built on. I hope they are broke and this eyesore fails to go ahead 1/10. I hope this development does not happen, it looks awful and this street is bad enough for parking and flooding without some broke company moving in to disrupt residents and businesses on this ella street and chester street. Why stop progress? With well thought out sufficient parking planning this would not hinder the area too much (keeping in mind the distance from CBD). And for the disturbance of local residents, don’t live in a developing suburb/city if it is an unbearable act of progress. Looks like a time-current design to me. Towers belong on Ann Street. 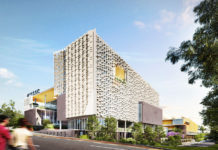 It needs to lose about five storeys, retreat from the Ella Street frontage by five metres, provide for a mix of one and two bedroom accommodation, not 300+ one bedders – is it an apartment building or an Ibis Hotel? – and deliver enough car parking to accommodate all occupants and visitors.